Reason for Discovery: John Green mentioned that he loved To Say Nothing of the Dog (#2) and Blackout (#3) and All Clear (#4) have been nominated for lots of awards, so I decided to read the first book in this series. In Doomsday Book, Kivrin, a student at Oxford University has a strong desire to travel to the Middle Ages. Luckily, in this universe, time travel is possible, and this is something that the professors in the different history departments in the colleges do on a regular basis. Even though not all of her advisers are excited for Kivrin to see the Middle Ages (it is rated a 10/10 for danger), she gets her chance. This is where everything hits the fan. Right after Kivrin gets sent back in time, the technician who worked the time machine falls horribly ill. This is worrisome, because no one gets sick anymore. Soon, more and more people are getting sick in Oxford and a quarantine is put in place. Worse yet, before the technician falls into a delirium, he suggests that something went wrong with Kivrin's time travel trip. The book flips between what is happening to Kivrin in the Middle Ages and to Professor Dunworthy in the book's contemporary time. It is a race against time in both time periods. This book is crazy good. Crazy good. Although you would think that Kivrin's journey to the Middle Ages would be the exciting story and the modern time story to be filler, both stories are really strong. From the beginning I was so worried about what went wrong with Kivrin's trip! Did she have what the tech had? Is she the cause of the Black Death? What went wrong with her trip??? At the same time, I was freaking out about what was going on in the contemporary time. Did Kivrin infect the tech? What caused the illness? How is Kivrin going to get home, if everyone is sick? This book is a bit on the long side, and with the audio book, I felt like I was never making any progress. At the same time, every time I listened to the book, I really enjoyed it. It never felt like it was dragging. My best explanation for this conflicting set of emotions is that a large portion of the book is focused on setting up the pieces for the final act. I didn't feel like the initial acts dragged, but if I had to describe what happened in these initial acts, I would have to say "not much." In the initial acts, the focus is on the characters and creating that tension and fear. I thoroughly enjoyed the entire book, but the last 30% of the book is incredible. I found myself staying up late, so I could just listen to 10 more minutes, 20 more minutes, 30 more minutes. I stayed up way too late last night, just so I could find out how it all ended. Let me tell you, when the craziness of the final act of this book hits, you feel all the feels, all the emotions. This is because so much of the book is focused on getting to know these characters and setting up the tension. I was almost in tears at the end, because things were happening to these characters that I had grown to care about and I felt so hopeless, which was an emotion that Kivrin and Professor Dunworthy were also feeling. I am looking forward to continuing with this series, because this book was amazing and the other three books in the series are supposed to be even better. I give this book 5 out of 5 kitties. Pam amazing-tastic review, you have me excited and my heart racing with the suspense of it all and wanting to know what happen! I want. This is one of those books that you really can't judge by the cover - I would have passed it by! Can I say that as a Medieval Historian I'm already very envious of these characters?!!? The ability to go back in time to study the past! How awesome would that be? I'm excited to read it - Fantastic review! The book is great, you might want to try the audio book if the physical version doesn't pull you. 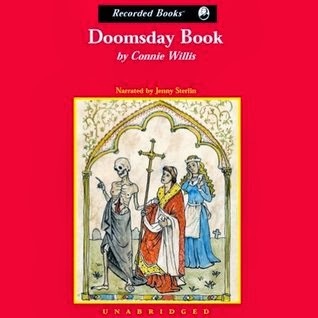 The other cover is just the title "Doomsday Book." I only picked it up, because I had heard good things about the rest of the series. I have also heard great things about her short stories too.